Host: Sunny Giorgio Plugme. Featuring 3 Frames of female warriors and highlights from issues to come. Including Beach Bums. Alley Strips, Cordial Cameos, Soul Searching Visions , Neo-Art, Latin Tragedies, Comeddia DellArte, Blue-zee Flossie's and Jazzy Babes. We'll put sparks in your sparks and fan the flame of passion and fire up your soul! Host: The Metalurges, Calliope, Fideos & Confetti, Adorable Aliens, and more. Plus a blend of little band and original cast recordings in midi format and much more! Why Wait? You can Have it Now! : Self-Indulgence or Self-Creation? Host Cartoon Character: To Be Announced Garage and Alley Designs of the 60's: Kant Wayt and Lakarhythmics flip out on form and function of '60s design and bands that played out of the crate; Mermaida jumps into the crate for classic 60's garage rockers and checks out the scene, the times and the players of this juicy bit of design history to include: The Metalurges, The New York Bums, The Trees of Life, The Jelly Beans, and oh so much more. 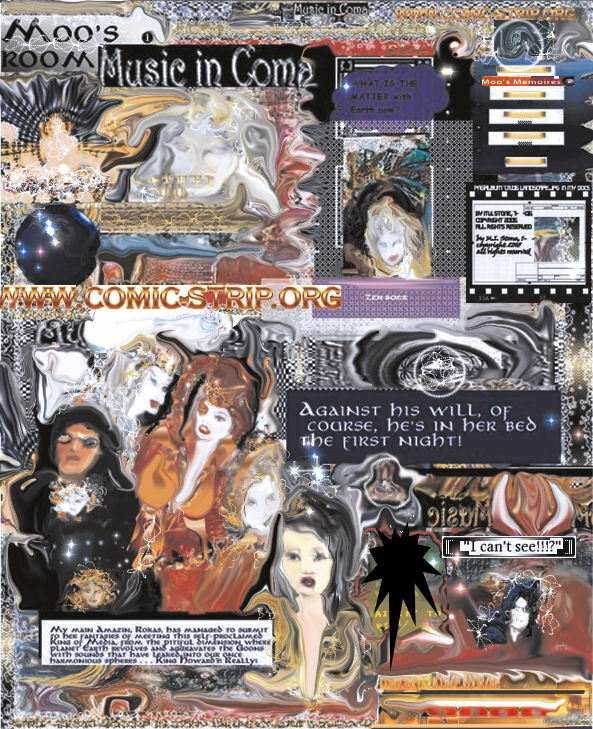 FIRST TEST SITE & ISSUE, TEST EDITION, Saturday Feb 14 , 2011) Intergalactic Femme Fatales, the Amazin's, counter-strike the universal nemesis duo, known to the earthbound as The Genesis Goons, which have been making life tenuous, uncomfortable and jittery. The anti-heroes live out their form of life in a parallel universe which corresponds to ours in many ways, eerily similar world leaders and hidden forces intent on making their beliefs, of One Religion, One World, come true, the One World Goons. That's how they're known in their land.